As soon as I saw Will Smith in his military uniform appear on the E! channel, I screamed and put aside my Nintendo DS gaming for another free evening. There’s no way to have escaped this 1996 movie unless you have ignored Roland Emmerich films or lived in a womb for the past 14 years. Enormous space crafts suddenly appear above the major cities of the world. Then, total panic as the ships fire a weapon designed to decimate those cities in minutes then move on. The military and small alien crafts battle, the president visits Area 51, individual characters’ stories intertwine. In the end, team human has to figure out a way to disable the protective shields while also obliterating the mother ship. It’s a result of War of the Worlds and Star Wars. Still corny? I can watch this movie over and over. This is definitely a movie where I wished I could put on the director’s commentary and hear the thoughts behind the production. I remember owning a book that showed a behind-the-scenes look. Come on… Will Smith? Jeff Goldblum? Fighting aliens threatening to kill of all humans in order to take over the earth? ET finally grew up and grew deadly. I watched it again and realized the corny touches. Stereotypical Jewish guys—very smart—save the world. The funny yet motivated black guy. The deadly aliens look like monsters (ET and Stitch step aside). The lead scientist in Area 51 is socially awkward and crazed in appearance. Young, good looking president. But I also have to wonder—how did the aliens know to aim at the white house where everywhere else they aimed at the tallest building? How did the captured alien know to communicate with the president? The real 4th of July celebration is about the American colonies achieving independence from England long ago. Now, as this American holiday approaches, remember, the 4th of July has become a worldwide holiday. 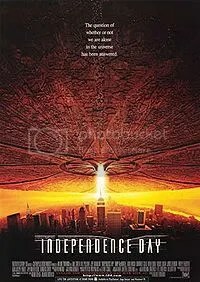 No matter the race, culture, or appearance, in 1996, the entire world decided to stand up and fight aliens who were threatening the survival of mankind.